CubeBackup - How are email reports and notifications generated? How are email reports and notifications generated? The email report data is always generated locally on your backup server using the database files to produce a statistical overview of your backups. If cubebackup.com is selected in the Send email via dropdown list, this overview will be sent from your backup server, using MailGun’s API, to the recipient or recipients you specify. The sender will be listed as either ‘notification@cubebackup.com’ or ‘local@cubebackup.com’. TIP: MailGun is a well-known provider of email APIs services, which enable developers to integrate email features into their products. If Custom SMTP server is selected in the Send email via dropdown list, the overview will be sent through your own mail server and therefore be completely private. 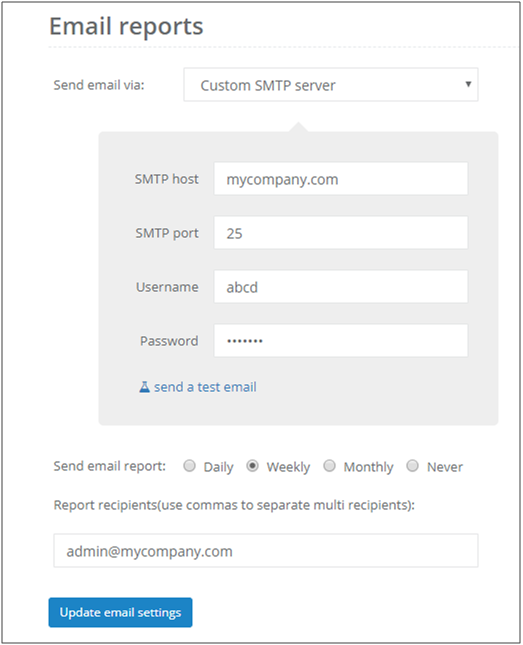 After setting up of your custom SMTP server, you can click send a test email to verify whether all settings are correct.